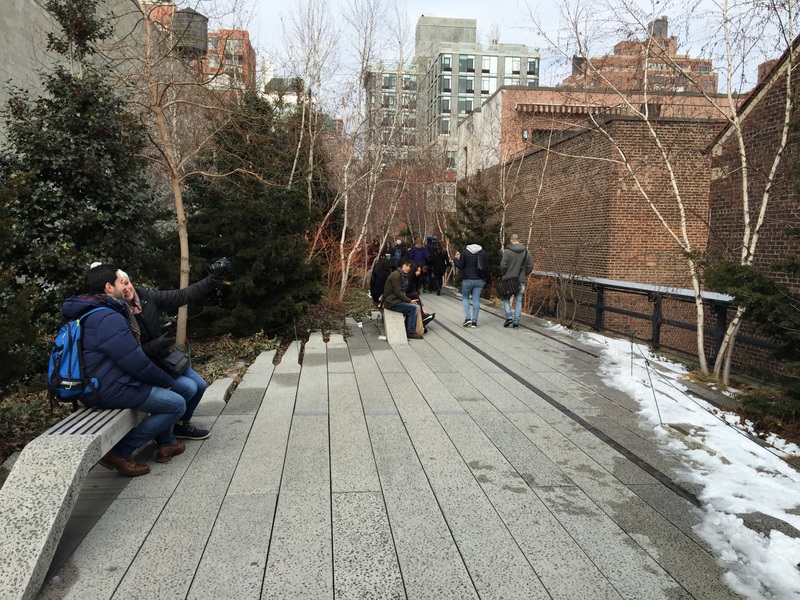 People walk, sit and take selfies amid the hollies and other trees in the Chelsea Thicket on the High Line. A few weeks ago, gentle readers, winter gave us one last flipping of the bird by causing it to snow on what was officially the first day of spring. A wicked case of cabin fever had me craving a long and substantial walk, especially since I needed to start getting back into shape for longer summer hikes. But where to go? Most of the more rugged hiking trails I like to frequent were, after the first-day-of-spring storm, covered in snow. On top of that, I was facing the usual crunch of five million demands on my time. On the second day of spring, a Saturday, I had to go into New York to run a couple of errands. And there was a place in the city that I had been meaning to check out for quite some time – the High Line. What is it, you may ask? The High Line is an old freight rail line (about a mile and a half long) running down along Manhattan’s southwest edge that has been converted into an elevated park/walking trail/green space. So that afternoon, after I’d made the other stops on my trip, I got off the subway at 14th Street and walked west to Gansevoort, where I saw the stairs leading up to the High Line at its southern terminus. The line started out as a freight railroad running in between 30th Street and the city’s Meatpacking District in the 1930s. The line itself went out of use in the 1980s and eventually started falling into disrepair. Several local groups began, not too long after, petitioning the city and the railroads to have the High Line turned into recreational space. The trail is part of New York’s park system, and is maintained and administered by the Friends of the High Line. At various points, you can find various outdoor art installations, water features and special sections like the Chelsea Thicket, the Falcone Flyover and the 23rd Street Lawn. From 14th Street, the trail heads up, mostly paralleling Tenth Avenue, and comes to an end around 34th Street and Twelfth Avenue (although on the day that I visited, the section that goes beyond 30th Street was closed for the winter). At various points in between, there are a bunch of intermediate access points with stairs and elevators leading up from the street (the website’s got a complete map). This section of the High Line crosses over Tenth Avenue and 17th Street, and features deciduous trees, grasses and vine trellises. Most of the path is covered over in compressed concrete, but there are certain spots where you can see what remains of the old tracks and switches. The High Line’s website explains that many of the trees and plants are local species, and in fact were specially chosen for their abilities to absorb rainwater. 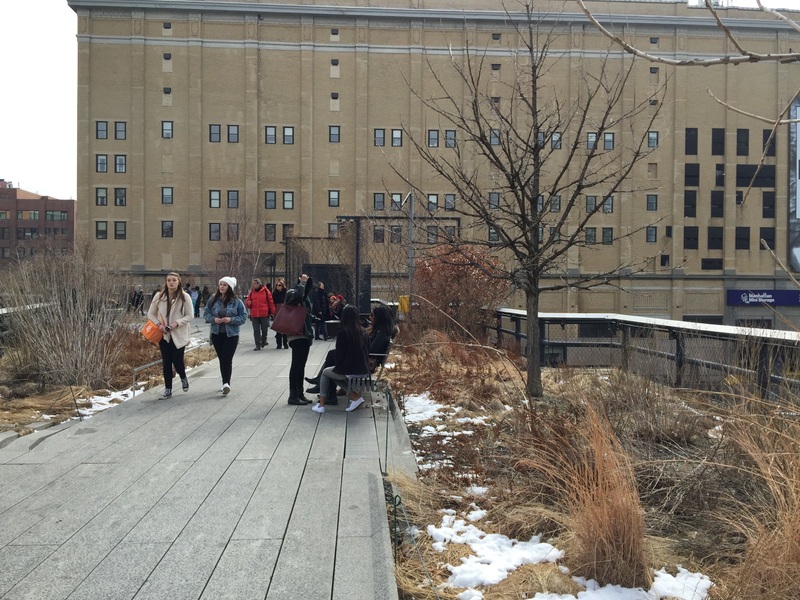 So, in addition to its other functions, it seems that the High Line is a giant rain garden. A lot of the grasses and plants were still winter-brown on the day that I visited, and the deciduous trees were still bare, but if you looked closely enough, you could see some hints of green sprouts and buds starting to show. Off to the west, you get a nice view of the Hudson River, and beyond that, a designated preserve for various species of yuppies and hipsters (also known as Hoboken). At 30th Street, I descended the stairs back down toward the street and began making tracks for Penn Station. Now, some people are undoubtedly going to argue whether walking in a New York City park is really hiking; in fact, I’m looking at just that subject for a future blog posting. The High Line, I feel, is just the same as any other rail trail you’d find out in the woods. It’s built on a disused rail bed, there is lots of local flora and fauna (pigeons and squirrels) and it encourages people to come out and walk. Sure, I did see the usual flocks of people with the increasingly ubiquitous selfie sticks. But most people were just strolling along, sitting on the benches and chatting. It seems to me that after this winter, all of the city was desperate to get some time outside – even if there was a dusting of snow on the ground. One thing I immediately noticed was how much quieter it was up on the High Line than it was down on the street level. There’s a few possible explanations for this, I think. For one thing, we were obviously above the traffic. No surprise there. But as any hiker or outdoorsy person will attest, there’s something about being out among trees and nature – even if it’s in a city park – that’s calming. And in a place like New York (any of its five boroughs), you need places where people can hit the pause button. So that’s why we need places like the High Line, the big parks like Central Park, and all the little pocket-sized parks and green spaces – they’re a place for people to decompress. In fact, I saw a sign among some of the grasses that said “Restoration in progress.” It technically referred to some of the plantings being re-established. But it’s got another meaning: people who come up for a walk on the High Line often end up feeling a little better afterwards. And that’s what a walk – whether a short stroll or a full-length hike – is supposed to do for you.